If you are remodeling a bathroom instead of starting from scratch, you’ll need to determine which bathroom systems need to be upgraded to meet codes and to ensure that the bathroom is safe and functional. To determine if the plumbing system is adequate, you should check water-supply pipes to make sure they are sized to provide an adequate volume of water to each bathroom fixture, and look for unvented or undersized drains as well, a real problem that is quite common in older homes. Venting a fixture properly can become a real thorny issue in a renovation because it is often unantici­pated and can involve opening up walls. Other things to look for include the presence (or absence) of shut-off valves, leaky pipes, and an adequate hot water supply. The big wild card is changing fixture locations. Practically speaking, there isn’t a lot of difference between changing the location of a toilet 1 ft. or 10 ft.; in both cases a large drain pipe will have to be cut and moved. Moving any plumbing fixture involves substantially more work than simply replacing it, particularly if access to the floor system is limited. 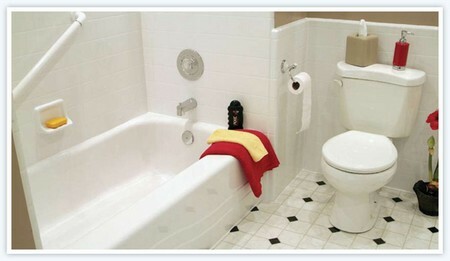 Don’t ignore the bathroom’s heating system, which often isn’t up to the task of keeping its occupants comfortable. If the heating system has insufficient capacity, it will need to either be upgraded or supplemented with another heat source. Usually a bathroom isn’t a very large space, and a ceiling-mounted fan/light/ heater will sometimes provide adequate supplemental heat. I think that tying into the existing system is a better option when feasible, either to provide more capacity or to upgrade the heat-delivery system (for example, with new adjustable diffusers or new baseboard convectors). Remember, too, that heat is more effective when delivered at or near floor level, something that a ceiling-mounted heat source has trouble with. Upgrading a bathroom’s heating system can involve considerable expense, however, particu­larly if the existing system is marginally adequate itself. Almost inevitably, the electrical system in an old bathroom will be subpar, usually because there will be no GFCI protection. It isn’t unusual to find a bathroom without any outlets, except perhaps an ungrounded one in the medicine cabinet. Unswitched light fixtures and non-GFCI-protected outlets will need to be disconnected and replaced with a code-compliant system, which usually means bringing another electrical circuit to the bathroom. An additional circuit might be required, too, for a supplemental electric heat source if the primary heat system is inadequate. A ventilation system may also need to be installed or upgraded. 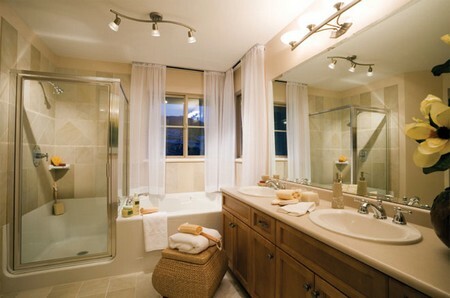 Many bathrooms don’t have a ventilation fan, and many that do have noisy ones. It’s also important to make sure that the fan is ducted correctly with either metal or PVC duct directly to the outdoors. I’ve seen some fans ducted into an attic, apparently in the hope that the humid exhaust air would eventually escape through gable vents. It will, but not before its moisture condenses on cold sheathing and framing, eventually causing them to rot. I’m not much impressed with flexible plastic duct either because it deteriorates rapidly and develops holes and leaks. It’s easy to install and that fact alone often makes it an attractive choice, but it just won’t hold up well in the long run.